A few WordPress clients hosted through 123-reg have received alarming emails concerning a security issue with WordPress, stating that they’ve been made aware of a security issue facing websites using WordPress. We know that if there ever is a known issue, WordPress are going to be on top of it faster than a speedy fast thing so the first place we look when receiving news is the WordPress forum as well as do a quick Google. Because WordPress is so popular it is likely to be an easy target if a server is hacked into – so it is always sensible to have strong security in place as standard. Upgrade your WordPress, especially if you are using a very old version – the updates are made to counter known issues, especially security. And of course have your backups in place! For many of us, choosing a theme for our WordPress can be satisfied from the WordPress Free Themes Directory – you can search through these easily and upload without having to move from the comfort of your Dashboard (Appearance, Add New Themes). And I would suggest that choosing from themes already approved by WordPress themselves is likely to be good security practice. Now some of us want more – functionality, choice, support – and for this we are happy to pay for a Premium Theme – those tried and tested by us are listed below, together with others that we consider trustworthy. Or you might want a bespoke theme created for you – something simple that can be created with Artisteer (which was used for this blog and a few others we’ve worked with), or something more complex that requires some geek attention – again, a solution you can feel secure with (if you trust your geek!). Take a look at the bottom of the page – in the theme’s footer area. Is there a link that perhaps you’d rather not have associated with your business? This is very common and many an unsuspecting blog owners ends up with a link to “Online Bingo” or worse (much worse”). How do you feel about the site on which you’ve found this lovely theme? Are you met with pop-ups or anything that makes you at all uncomfortable? Avoid such, I suggest! Keep an eye on the theme creator’s blog for any upgrades available, etc. Take a look through the WordPress forum for any issues with that theme. 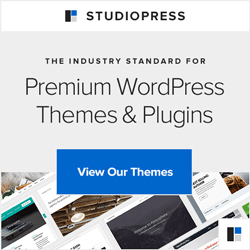 I think you get the idea, and there are plenty of free WordPress themes that will suit you just fine, but if you want to err on the side of caution, stick with one of the first 3 options. And if you are ever unsure, we’re here to guide and help you.